← India – The Faltering Tiger? 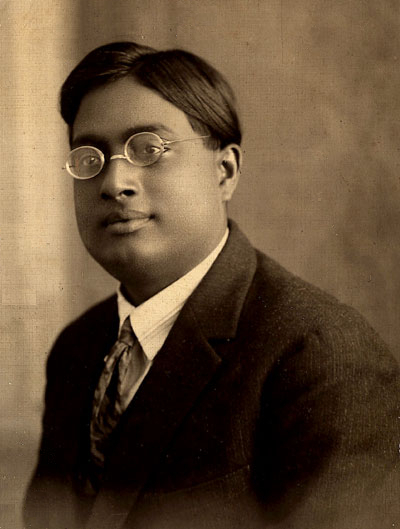 Satyendra Nath Bose (1894-1974) was a famous Indian Physicist and Mathematician known for his collaboration with Einstein in providing key insights into the foundational developments in Physics. These include the theory of Bose-Einstein condensates – the weird, degenerate properties of matter when cooled to very, very low temperatures. He should have won the Nobel Prize in Physics but, for some reason was overlooked although many in the same field who did extensions to his ground breaking work did get the coveted prize. To honor him a fundamental class of elementary particles, ones that cause the existence of the basic forces in nature (such as gravity, electromagnetic etc.) are named bosons. The famous and most recent member of the boson family is the Higgs boson – and everybody in the world has been looking for it. On December 13th we heard some tantalizing news from CERN, the world’s most respected center for fundamental physics research, situated in Europe, straddling Switzerland and France. CERN’s latest super-gizmo, the Large Hadron Collider, along with Fermi Labs’ Tevatron (located near Chicago), have been looking for the Higgs boson or the God particle as it has been famously dubbed. And they may have just found it! If they did it would turn a fantastic construct of the human mind into reality in explaining the fabric of our universe. OK, so what’s the Higgs and what does it mean? The Higgs boson is the proposed answer to a simple question posed by a bunch of physicists – why is there mass? The Standard Model, (**See Box for a simple description) which is the most comprehensive, fundamental description of our Universe, could only accommodate the existence of mass if something was breaking a perfect symmetry in the Model. In 1964 a British researcher, Peter Higgs and his colleagues postulated the Higgs particle which interacted with other particles to break the symmetry and produce mass. This was purely a theoretical construct, adding yet another member to the seeming menagerie of particles that constitute the fundamental building blocks of our Universe, and an attempt to salvage the Standard Model. On December 13th 2011, two of the researchers at CERN’s headquarters in Geneva announced to a breathless world that they had found something that looks (as the Economist magazine put it) encouragingly “Higgsy.” What they found does not meet the strict requirements of a conclusive proof, but the results were statistically very promising as two independent experiments from two different approaches gave the same results. These experiments at CERN are mind blowing. 300 feet below ground they built a 17-mile loop in which they produce the coldest and fastest proton beams on earth. One billion protons per second, travelling close to the speed of light are then injected in opposite directions and circulate 11,000 times per second speeding up all the time, propelled by super-cooled magnets. At 4 points the beams intersect – after 100 billion protons are squeezed into a tube with 1/3 the diameter of a human hair causing incredibly high speed collisions. Millions of very sensitive sensors read the debris trails that are created from exploding protons and look for statistical signatures predicted for the Higg’s boson. They do this day in and day out as the probabilities of head-on collisions remain low even with the enormous squeezing of billions of particles. 150,000 GB of data has been collected in 2011 alone and is crunched using the world wide net all around the globe. Proton-proton collision at CERN. Red lines are signatures of muons with characteristics expected from the decay of a Higgs boson. And the researchers are giddy with what they have found – almost conclusive evidence of the Higgs. It will take the entire year of 2012 to be sure. There could still be many a slip between cup and lip, but everyone suspects we are at the threshold of history in the making. If we can unambiguously demonstrate that the Higgs boson exists it would be a great mind-over-matter victory for physics. And physics surely needs it. Currently there are many unreconciled directions in which physics has progressed and many contradictions exist. Even with the validation of the Higgs field, the Standard Model cannot integrate quantum gravity with quantum mechanics and has no model for dark energy and dark matter, two bizarre substances that seem to pervade the Universe. Also a pair of recent experiments have thrown up the possibility that neutrinos can actually travel faster than the speed of light thus violating Einstein’s theory of relativity! Many say we need a new paradigm in physics – the last really monumental work in physics was only done a century ago. Ever since we are chomping at the edges and accumulating contradictions, waiting for the insight that will unify everything again. Last year while visiting the Tata Institute of Fundamental Research (TIFR) in Mumbai, India, I met a physicist, C. S. Unnikrishnan, who runs a world class lab in Cold Matter physics and is a member of a team building INDIGO, the Indian gravity waves measurement experiment. In his spare time he claims to have developed a Higgs-like formulation to the question, “Why do we have a speed limit in physics equal to the speed of light?” He claims it is not a fundamental law of physics but mediated by a gradient field. His ideas are very radical indeed and he was getting much resistance from the conventional thinkers in his field. But now, with the neutrino experiments showing matter travelling faster than light maybe he will be taken seriously and we may see the emergence of an “Unni” boson! Let’s take a layman’s tour of the Standard Model of Physics. Our Universe consists of two sorts of entities, namely, Matter and Force. Everything that we see is explained by the interaction and interplay of these two kinds of entities. We all learned in school that matter was made up of elementary particles called atoms. Later we learned that atoms themselves were made up of even more elementary building blocks: the electrons, the neutrons and the protons. Today we have broken matter down even further, into even more fundamental matter particles. These particles are collectively called fermions, after the physicist Enrico Fermi. There are two classes of fermions, the quarks and the leptons. There are six quarks that combine in different ways to produce matter components – so for instance the protons and neutrons are made up of three different quarks each. There are also six leptons. Individually or in combinations they form other elements of matter. Electrons and neutrinos are examples of leptons. All matter is made up of fermions. There are 12 fermions: 6 quarks and 6 leptons. There are 4 fundamental known forces. The two most popular ones you are familiar with: Gravity and Electromagnetism. There are also the so-called Weak Force and the Strong Force that act mostly at the microscopic atomic level and are therefore never experienced by us in our day-to-day lives. The Standard Model associates with each force a particle that mediates (or causes to exist) that force. If an elementary particle is capable of interacting with a given force-particle then it can feel that force, otherwise it is immune. These fundamental force-particles are called bosons, after our aforementioned friend, Satyendra Nath Bose. 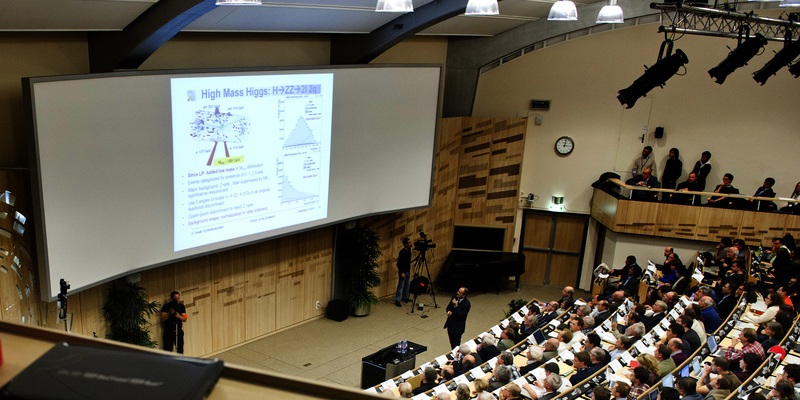 The Higgs boson itself has mass and the CERN experiments are pointing to a mass about 150 times the mass of a proton. This means that Higgs bosons interact with other Higgs bosons to produce mass for themselves! This entry was posted in Cosmology, Current Events, Money, Science. Bookmark the permalink. 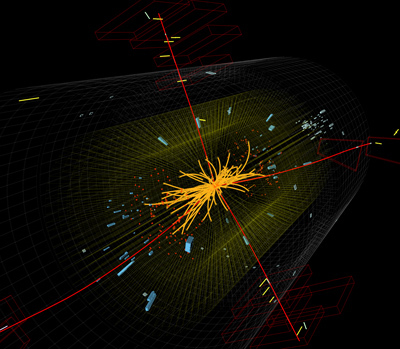 5 Responses to The Higgs Boson – Have We Just Found the God Particle? You did a great job of explaining very complex physics. I don’t really understand what “signature” for Higgs they are looking for, or why, if indeed its mass is 150 times that of a proton, it has been so difficult to detect. The related note on the gravity wave experiment was also very interesting. Thanks for bringing all us lay people in from the darkness. You have a gift of explaining difficult concepts in a very simple way. I enjoyed your well written blog and also at the same time learnt a lot. Keep up the good work. When a Higgs boson disintegrates it decays into other particles with theoretically defined compositions and therefore can be detected in the debris in a well designed calorimeter. So you first have to manufacture a Higgs boson. For this you need high speed collisions. The more the mass of a particle the higher the amount of energy needed to “manufacture” it. The mass of the Higgs being about 150 protons (or about 135GeV) means we need energies larger than 135 GeV to “forge” it (and then quickly study it in a yoctosec before it disintegrates!). This is what the LHC does. Clearly one proton completely annihilated cannot produce more than its mass’ worth of energy (E=mC^2) and a proton weighs only 0.8 GeV, so several protons are annihilated to produce enough energy to briefly create the Higgs. In general the heavier the particle the harder it is to find it because, unless it exists under normal conditions, we have to create it by smashing enough energy together. Supersymmetry predicts cousins of each particle that are much heavier and we have scant chance of finding them because they are very heavy.